← DENNIS ARGALL. Trump-Kim, Korea, China and the future. ANDREW GLIKSON. Silence over the acceleration of global warming. If there is a single critical issue science has ever conveyed, it is that altering the composition of the Earth’s atmosphere can only bear fatal consequences for nature and humanity. It is estimated that, to date, some 150,000 to 400,000 people world-wide have perished each year due to the direct and indirect effects of global warming (https://newrepublic.com/article/121032/map-climate-change-kills-more-people-worldwide-terrorism; https://www.scientificamerican.com/article/global-warming-and-health/), including for example 1833 in New Orleans, possibly 5000 in Porto Rico, 6329 by typhoon Haiyan in the Philippine. The list goes on. While these events have been documented in detail, the silence in most of the mainstream media regarding the connection between global warming on the one hand and the rising spate of hurricanes, storms and fires on the other hand, is deafening. 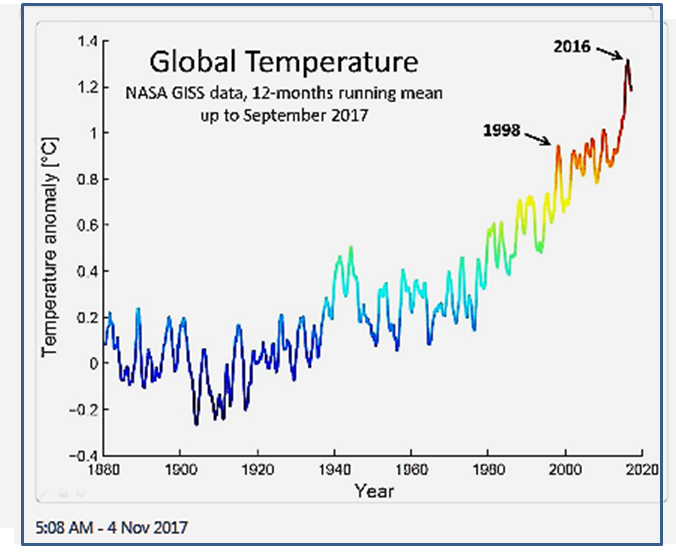 Mean global temperature has accelerated between 1998 and 2016, rising by about 0.4 degrees Celsius. The projected trend, inducing large-scale melting of the Greenland, west and east Antarctic ice sheets, meters-scale sea level rise, and consequent hurricanes, storms, heat waves, fires and droughts, already commenced in the 20th century, threatens to render large parts of the planet uninhabitable. 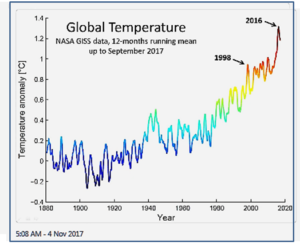 Even though climate science clearly indicates the rise in atmospheric carbon and temperature are responsible for these developments (https://johnmenadue.com/andrew-glickson-hurricanes-and-megafires-abound-but-dont-mention-the-words-climate-change/), only rarely do media reports of extreme weather events include the terms “climate change” or “global warming”. By contrast, false expressions such as “one in 100 years event” are common. Many people are unaware the world around them is changing due to carbon emissions. Vested interests and their political mouthpieces have been telling untruths regarding the causes and consequences of global warming. With few exceptions the mainstream media continues to either propagate half-truths, or remain silent, or deal mainly with related economic issues, as if anything like the present economy could survive under +4 degrees Celsius above pre-industrial conditions. Whenever the term “future” is expressed in the media and in Parliaments, it is rare that a caveat is made regarding the effects of global warming, given the currently 2 to 3-fold rise in extreme weather events. Climate-related articles and letters are regularly ignored. In August 2017 an open letter to the Prime Minister regarding the climate crisis, signed by 200 scientists, was almost totally shunned by the mainstream media https://thebeeliargroup.files.wordpress.com/2017/02/open-letter-to-the-australian-pm_17-10-2017_including-figures.pdf). Only little or no information is given in the media regarding what the future holds under +2 or +4 degrees Celsius, projected by the IPCC to occur within this century. With exceptions, nor does most of the mainstream media report the global consequences of a nuclear exchange. In this regard, while there is no lack of pejorative terms in the press indicting various countries, the promotion of efforts at reaching peaceful solutions between rival nations appears to be rare, conditioning the public to looming scenarios of a WWIII. Climate science and scientists are rarely represented on media panels, by contrast to science infotainment programs where attractive celebrities promote space travel to the planets and beyond. Can the climate crisis be tackled in time if much of the mainstream media declines to expose the critical facts and their consequences? Andrew Glikson: Earth and paleoclimate scientist. 6 Responses to ANDREW GLIKSON. Silence over the acceleration of global warming. I can appreciate and share the author’s frustration and sense of gloom and expressed pessimism about what altering the earth’s atmosphere has done, is doing and will do to life on earth. The outcome is tragic but the planet is just fine (G Carlon) and will continue on in its altered state without us, most if not all mammals, vertebrates and invertebrates life forms alike. We know what the planet was like at the temperature levels coming and it did not include human beings or most of the plants and lifeforms we are familiar with today. We are bound by stupidity, stupid politicians, stupid institutions and stupid communities and stupid familial relationships, stupid because our inability to either understand or wish to understand the simple basics of meteorology or what causes weather and what is climate and we are trapped mentally by our existentially derived but internalised knowledge and beliefs. Even now when it is clear that life is no longer comfortable or predictable due to the changing climate and atmosphere we ignore the signs in the weather and what is happening around us. Insulated by our industrial lifestyles and totally dependent upon those mechanical systems driven by fossil fuel energy. We have never understood the nature of pollution except when it becomes poisonous and this world is rapidly becoming poisonous to us and every other current living thing. As a species we are in gross overshoot, we have overshot the capacity of the planets life giving systems and limited resources to support us and selfishly ignore the plight of those who are already victims, whether it is the body count or the dire living conditions of a large part of global humanity. We are also it seems, collectively, all of us, too stupid to admit that basic resource limits barrier either and to stupid to understand that significant and radical change is now required to every facet of the way we organise our lives, the way we eat, the way we travel, the way we trade and share out resources and the machines that we have at our service. We prefer delusion, we prefer fantasy and we prefer ourselves above all others, so we listen to rubbish about the climate from scientifically uneducated idiots, we prefer the succour of fools and we cling to the past thereby reinforcing and maintaining our internalised selfish comfort and falsehoods as truth. Here’s the problem Andrew – Mr and Mrs Average, community member, politician, business owner, business manager, farmer, fisher, miner, techie, mechanic, driver or cleaner or anybody else have no understanding of gas behaviour and laws, thermodynamics, molecular physics (CO2 is triatomic, really? what? so what? ), oh! the worlds base aggregate temperature has only risen 1.5 degrees gee that’s not much, no only a 10% increase folks! It won’t rain, so what, it is unpredictable anyway, the ice will melt, oh yeah but there is a lot of it. It will be so hot in summer you will have live underground, nah we’ ve got air’conditioning – so at every point you will be defeated by this stupidity to learn and to understand. As Trotsky once said, ‘Revolution is impossible until it is inevitable’. Same with doing something about stopping climate change and you know and so does anybody else with some measure of intelligence, that is unstoppable now and can only get worse and worse and worse for us. ‘Yeah but we are going to die anyway’ [as they are thinking – yeah but it won’t be me] that will be the answer. 1. The media has been providing false ‘balance’ for many years by giving equal space to deniers. 2. Climate change is a slow burning problem. Even with climate change unleashing otherwise improbable weather events, your average Joe is unlikely to respond in a visceral way to some statistics about climate as they would for a terrorist attack – where the threat is felt and there is a definite enemy and clear and present danger. Media outlets are businesses that look after their bottomline. Even Fairfax journalists will complain they can’t sell newspapers by filling their pages with science reports. 3. After talking up the issue for a long time, our PM abandons it when he realises he really only cares about being prime minister. Global threats can wait until the dinosaurs in his party can process them. 4. In the Anglosphere, climate change has become a left/right issue. Since denialism and lukewarmism has been taken up by the right, rightwingers tend to become more entrenched in their beliefs when presented with evidence to the contrary. 5. The climate wars has destroyed any meaningful possibility we had of addressing climate change at a federal level. Labour don’t want to get wedged by the Coalition and be on the wrong side of an opinion poll. Short termism is rife. 6. Climate Change has become extremely difficult to talk about. Even renewable energy is talked about in terms of jobs and benefits to the economy and less about in terms of the urgent need to reduce emissions. 7. When climate change is not about science or disasters, it is about politics. When politicians talk about it, it’s all waffle and technocratic nonsense. It is no wonder people turn off. That’s not an exhaustive list. But it illustrates why it is just so hard to talk about climate change. Yes, it is hard, even impossible. We have to be able to answer to our conscience, with regard to the future or lack of such of future generations and of nature. Get your priorities right, Andrew! Our politicians & media are far, far too busy dealing with really important things – such as whether or not the ANU should partner with the Ramsay Institute to deliver a vital undergraduate course on Western Civilisation – for them to worry about trifles like the de-civilising impact of climate change. I don’t know the answer to your final question. It seems to me that the response to the problem is coming from business and consumers not politicians. Which from a political point of view (from someone on the progressive side of things) I find extremely worrying.